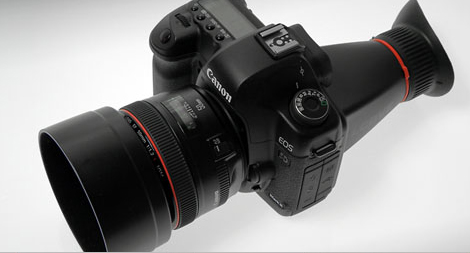 Now, an accessory that really makes DSLR's video ready. Of the millions of DSLR (Digital Single Lens Reflex) (most cameras with interchangeable lenses) cameras that exist around the world, a good percentage of them are capable of shooting video. Whether shooting 720p or 1080i, these DSLR's are capable of shooting extremely high quality footage. Entire films actually have been shot using nothing other than a DSLR or HDSLR. The problem with shooting video on these cameras has always been the viewer. While looking through the conventional eye-piece works well for shooting stills, you are unable to use the eye-viewer when shooting video. The photographer must use the LCD panel on the back of the camera and that's where the problems start. Most people can't focus on the LCD panel unless held at some distance from their eyes, and that distance is unusually uncomfortable to steadily hold the camera for more than a few seconds. A company in Estonia called Kinotehnik saw this problem and created an extremely elegant solution. A magnetic rim is provided that sticks around the perimeter of the LCD screen. (In fact, they supply two.) Then, the approximately 3 inch long viewfinder magnetically snaps onto the rim. With the patented optics included in the LCDVF, you can place your eye up tight to the viewfinder and see your LCD screen perfectly. They claim the view you get is equivalent to watching a 42" screen from 4.6 feet away. That's big, bright viewing folks. There is no diopter correction built into the LCDVF. Once the LCDVF viewfinder is in place, and you have put the viewfinder up tight to your eye, your elbows and arms can be braced in normal fashion, and you can shoot with relative steadiness for long periods of time. Without the viewfinder, I would always start to notice shake in under 10 seconds. The accessory can still be used even if you are using a tripod, which is obviously your best choice for long shots. The viewfinder can be flipped 180 degrees for left or right eye viewing. Besides steadiness, light glare was always an issue when shooting outside. The LCDVF eliminates all that as well. The solution is so elegant, but it took Kinotehnik to make it practical. Before LCDVF, I used a competitor's solution that looked similar but was anything but practical to attach to the camera. They required stretching elastic bands crisscross around the camera and that took forever. With LCDVF's magnetic base, the viewfinder is on and off in a second. The LCDVF has a lanyard attached, so you can let it hang from your neck between shots. When you are done using the LCDVF, it stores in a handy pouch, complete with a clip to faster it to your camera bag. The LCDVF comes in multiple models depending on your camera's LCD measurement. See this list to determine if your camera is compatible. To purchase a unit, you'll find a list of resellers on their website.